"What?! Are you crazy?!" You must be thinking to yourselves. Hold on! I agree with you, clearly, all is not well. But it can be. Can't it? Allow me to explain and then elaborate. But first I must go back into history to illustrate. In 1846's Mormon pioneers first began the long trek from Nauvoo, Illinois to the uninhabited Salt Lake valley. This trip was made in wagons, handcarts and on foot and continued with many different 'companies' for several years. Approximately 10% of these pioneers perished on this so called 'Mormon Trail' (part of the Oregon trail) with one company in particular loosing as many as one quarter of the entire group. Clearly all was not well with them. The primary reasons for their troubles came from either being poorly prepared or leaving too late in the season. With handcarts that would only carry 500 lbs of supplies I can see how it would be difficult to be adequately prepared for the 1,300 mile journey. I wish to illustrate how we can learn from the past to prepare for the future. There's no need to let the lessons learned by our ancestors go to waste. Despite their numerous problems during their journey, as well as the difficulties of creating a new settlement in the middle of the desert once they arrived, one of the things that kept them going was their faith. One of the ways they carried on with faith was with the help of Hymns, including a particular song that they sang and kept in their hearts as they crossed the plains. Come, come ye saints. No toil or labor fear. But with joy, wend your way. Though hard to you this journey may appear, grace shall be as your day. Do this, and joy your hearts will swell - All is well! All is well! With all of the trouble of the world right now, that we hear and see everyday, does it not lighten your spirit and lift your heart to have the right perspective in your preparations instead of doom and gloom? The proper attitude in a survival situation is essential! Many of us who are preparing for the difficult times that we know are coming our way may not in reality be emotionally, mentally or spiritually prepared for how hard it actually is going to be. We may have plenty of guns and ammo, food storage and supplies but that may not be enough. I personally do not fully comprehend the extreme level of difficulty and suffering that is possible but looking back to our ancestors helps me to gain some perspective. This perspective, I believe, will help me to better prepare for what the future holds. To be properly prepared requires us to be aware of current events which are filled with ugly and depressing news. We then attempt to compensate for fear and despair by buying more and more stuff. Yes, stuff is important to have, but far more important is to be spiritually prepared. Now, don't misinterpret my statement. I believe that it is our responsibility and instinct as human beings and as children of God to be prepared to survive whatever situation we find ourselves in. And should we die before our journey's through, Happy day! All is well! Oh, how we'll make this chorus swell - All is well! All is well! With the right attitude and perspective, that is only truly attainable through your own spiritual preparedness, by your own personal relationship with God and Jesus Christ, all IS well and will be well in the end. None of us can escape this 'end' but individually I hope that I can do as much good as possible before my end. 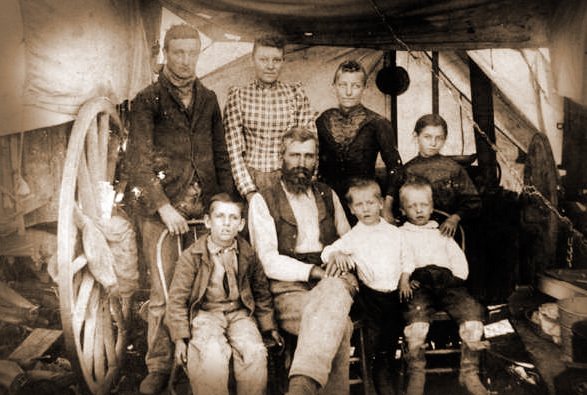 I believe that these Mormon pioneers knew these truths which ensured many of their survival. On occasion I like to play the Xbox game "HALO" with my brothers. I am sure many of you are familiar with it. One of the most frustrating times for me in this game is when a new games starts and I am killed off almost immediately. I am unable to make any progress before I'm terminated. This happens a lot as I only play about once a year. Fortunately, in this game we are "spawned" anew and get to try over again and again. The obvious parallel drawn here is that in the game of life we don't get that chance. We need to make our first and only chance count. But if we don't make it to our desired destination, and if we are spiritually prepared, then "All is well". We have the privilege and capacity to be the most prepared people to have ever lived on this planet because of the technology, resources and wealth available to us. This unique situation to us makes our generation either the most prepared or the most vulnerable that there ever was or ever will be. There's quite a dramatic difference between these two conditions. The difference in spiritual preparedness is also just as noticeable right now with statues being erected to celebrate Satan and monuments being torn down reminding us of God's commandments, the contrast is frightening. But don't worry, it will get much worse. Imagine the conditions of these pioneers. What gear did they take with them over their 1,300 mile trek? Wool clothing and blankets at best. Black powder rifles, Inferior steel knives and tools. Heavy canvas tents. Heavy wood handcarts and wagons that consistently broke down. How much better off do we have it now as to technological advancement?! The stark difference is nearly mind boggling. Although these same pioneers endured harsh persecution for their religious beliefs their physical trials were possibly even more difficult. I believe that we now face just the opposite conditions. Although our physical trials will be very difficult our spiritual and mental struggles will be even more so, thus the even greater need for spiritual preparation, perspective and attitude. I have often thought that as we see technology take over, the more simple things in life will become more desirable, just as the opposite was true as convenience from technology began to emerge. I find that this is becoming true as I speak to more and more people who desire to escape from technology and information overload, and seek the more spiritual nature of our soul. We are spirit beings first that were placed in physical bodies that have many limitations. Both of which need attention and nourishment. As we recognize what we lack in our physical preparations let us not forget to also pay attention to our spiritual needs. Let's take this approach as we prepare ourselves for the coming difficulties. Fortunately you don't have to wear only wool clothing and leather boots if you are planning on bugging out. Fortunately we don't have to try and keep our powder dry or cast our own bullets but have the lightest and most accurate firearms and most convenient and powerful ammunition ever known. We know exactly which guns we need and we know exactly the solar oven we need, but do we know exactly what we need to do to spiritually prepare? It is not my intention to tell you how to spiritually, mentally or emotionally prepare. That is a very personal search for each and every one of us. I will say that it is essential to your survival and should demand your immediate attention as you also continue to also build your physical preparations. As these pioneers made their journey to a physical place they believed would give them the freedom they so righteously desired, they came to realize that their spiritual strength is what made the difference and even saved their lives many times. I won't go into details with their many stories of struggles and survival but it was their faith and their attitude that "All is well!" that carried them through, made their journey bearable, and brought them closer to God. The same will be true with us but only if we are prepared. The time is now to gather the stuff that you will need to survive. The time is also now to be prepared for if we don't survive. In either case the truth can be "All is well!". 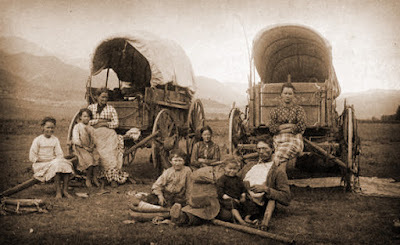 Images borrowed from the National Oregon Trail Center website.